I was a primary and secondary school teacher for many years and one of the things that I taught was history. It always occurred to me that the way we taught history, the events and people we chose to pull out of the continuum of time, was arbitrary. At the same time, we are so consistent about those choices from book to book and school to school, that a reinforced solidity emerges. The way we teach history becomes history, it creates our national mythos – the story we know and tell about ourselves and who we are. Most Americans know that Columbus discovered America, that Virginia was the first American Colony and that the Pilgrims held the first Thanksgiving in Massachusetts. They know about the Revolutionary War, The Civil War and America’s part in World Wars I and II, and later the Korean War and Vietnam. We also tend to know about the Industrial Revolution and its effect on American life and the dismantling of the slave economy. In short our national mythos is one of colonization, militarization and industrialization. We throw a few presidents and statesmen in along the way and that is the story we know about ourselves. What is largely missing is our Intellectual History. We don’t know the story of how our way of thinking and our worldview has developed. We don’t know the story of the evolution of the American mind. And to my thinking this is a huge omission. American history as I have seen it taught (and taught it myself) at the primary and secondary levels is almost completely devoid of a story of our nation’s great thinkers and philosophers – unless they had political significance. If a child grows up and you don’t tell them about some part of their history they will never know it existed. I often find that when I talk with people about the rich history of American philosophy. Initially there is often delight at the discovery, but it soon becomes clear that person doesn’t know if the fact that American philosophy exists has anything to do with them. After all they didn’t know anything about it. It does have to do with us. It is part of our cultural heritage because our way of thinking and our shared values have been partially shaped by that philosophical history – whether we knew about it or not. At the same time it is not much value to us until we do know about it. If we are unaware of our culturally held values they simply become an unconscious lens through which we see the world. When we learn about the intellectual heritage that has shaped our view of the world it takes many of our most fundamental “American” attitudes out of the realm of the unconscious and makes us aware of them. In this way we become more aware of the ideas and attitudes that are always guiding our decision making and we become more free in our thinking. 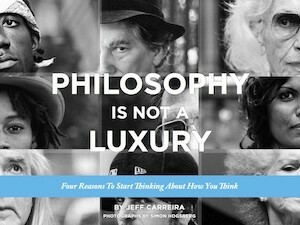 We can also begin to consciously understand and appreciate the philosophical perspective that has grown up here in our own nation and take responsibility in our own way for developing it – maybe not by becoming a philosopher, but by putting the best elements of that philosophy into action and creating a better future as a result. meaningfully and beautifully portrayed about culture and consciousness . How we can be the change to bring revolution in our culture . Thanks for the action of awareness,Jeff.